Abbott and Costello try to rescue their friend’s showboat from the hands of some unscrupulous cardsharks. 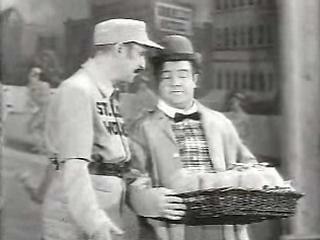 As Peary notes, Abbott and Costello’s first period piece together contains “several of their most famous routines.” The storyline is innocuous but relatively enjoyable, and — most importantly — never interferes with the ongoing litany of gags. Unlike Peary, I didn’t find the “shaving scene” especially funny; however, I was tickled pink by countless other hilarious moments (see below). Yes. While some reviewers disagree, I believe this film is a distillation of Abbott and Costello at their best.